A new coat of paint can give concrete steps a splash of color and update the look of your entire house. But only specific types of paint are suitable for concrete so you may have to perform additional steps in order for the concrete to hold the paint. In addition, a coat of paint may render your steps hazardous when wet, so if the steps will be subject to rain or moisture, slip-proof paint is imperative. Refresh your steps with a new coat of paint. Prepare the concrete steps for paint. If the steps are less than one year old, use a vapor transfer test kit to determine if the concrete will hold paint. Freshly poured concrete will cure within a couple of weeks but moisture and vapors will continue to work their way out of the concrete for a few months and may reduce the adhesion factor of the new paint. Tape off porch or wall areas that adjoin the concrete steps. 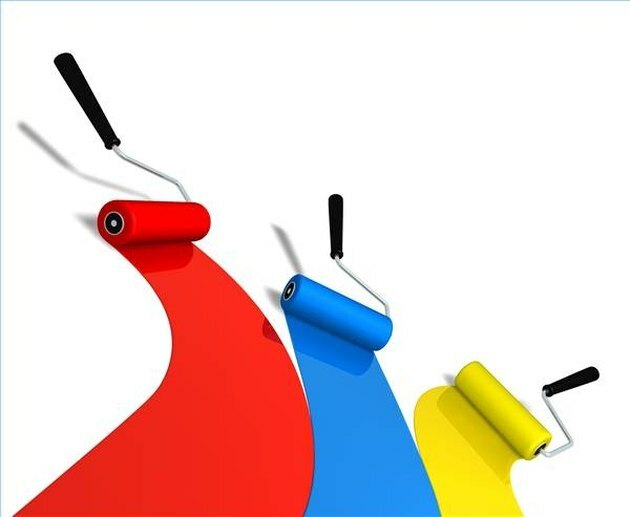 Use masking tape or tape made especially for painting projects and apply it where you're likely to over paint, along the sides and on the landing at the top of the steps. It's easier than trying to remove paint mistakes later. Apply a coat of concrete or masonry primer to the steps. Use a brush for the entire area or at least for the edges and the inside corners. You may use a roller for the rest of the surface area. Allow the primer to dry completely before painting. Most oil-based primers are dry to the touch within four to six hours but they won't be ready to paint for another eight to ten hours. Epoxy primers dry to the touch within an hour and are ready to paint within six hours in warm dry weather. Brush on a coat of masonry paint following the same method as you did with the primer. Use the brush along the edges and inside corners and (optionally) a roller on the other areas. Depending upon the paint you choose, you may be required to apply multiple thin coats or one thick coat. A thin coat of masonry paint will dry to the touch within two to four hours and you may apply a second coat after it is totally dry, around eight to ten hours in warm dry weather.